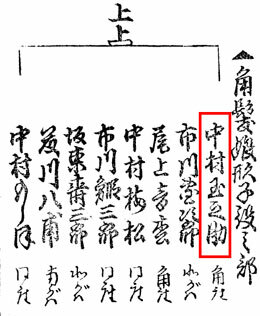 The actor Nakamura Matsue IV held the name of Nakamura Tamanosuke I from the 11th lunar month of 1816 to the 12th lunar month of 1827. Dates of birth and death unknown. Relationship to the Nakamura clan unknown. Previous stage names unknown. 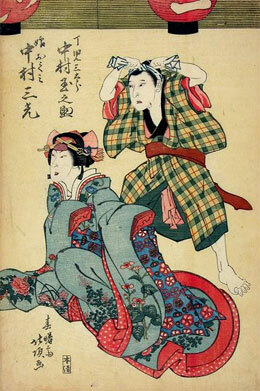 This minor koyaku and wakaonnagata actor held the name of Nakamura Tamanosuke II between 1831 and 1842. No record afterwards. Dates of birth and death unknown. Relationship to the Nakamura clan unknown. Previous stage names unknown. This minor actor held the name of Nakamura Tamanosuke III between 1867 and 1870. No record afterwards. Dates of birth and death unknown. Disciple of Nakamura Tamashichi I, his first stage name at the end of the 1850s was Nakamura Tanetarô. He took the names of Nakamura Kojaku and Nakamura Jijaku in the 1st and 7th lunar month of 1860. He took the names of Nakamura Kameshichi II in 1867 and Nakamura Tamanosuke IV in 1873. He was active up to the end of the 1880s. No record after 1889. Born in 1869. Relationship to the Nakamura clan unknown. Previous stage names unknown. This minor supporting actor held the name of Nakamura Tamanosuke V from the beginning of the 1890s to the first half of the 1940s. No record afterwards. His real name was Harima Matsusaburô.